“We have discussed the right-wing extremist Israeli and Judeo-Christian side of Breivik’s network, Israel’s interest in disciplining Norway, and Israel’s celebration of bomb attacks. In this respect, Breivik’s attack appears to resemble a new king David Hotel attack: July 22nd,” he writes. A Swedish academic has come under fire in Norway after writing an article suggesting that Israel played a part in the July 22nd massacre carried out by Anders Behring Breivik that claimed 77 lives. 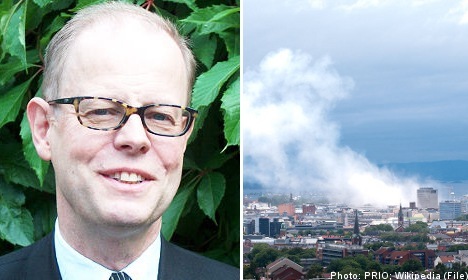 Swedish-born Ola Tunander is a research professor at the Peace Research Institute Oslo (PRIO), a research institute where he has spent most of his career since receiving his PhD from Linköping University in 1989. But a recent article authored by Tunander in which he seeks to discover what might have driven Brevik to set off a car bomb outside government offices in Norway and gun down 69 people at a summer camp for young Labour Party supporters, has prompted the head of PRIO to distance himself from the piece. PRIO director Kristian Berg Harpviken told Norwegian magazine Minerva that Tunander’s article left him with a feeling of “considerable unease”. Harpviken was also dismayed with what he viewed as a serious lapse in judgment on behalf of Nytt Norsk Tidsskrift, a multidisciplinary peer review journal, for agreeing to publish the contentious text in its latest issue. In the midst of a web of alternative theories, Tunander lays out a “simple chronology” detailing the fractious diplomatic relationship between Norway and Israel in the months before the massacre, with Oslo indicating it would be willing to recognize a Palestinian state. On two occasions, Tunander notes the significance of the date of the attacks. First, he travels back to 1973, when members of the Israeli spy agency Mossad were arrested on July 22nd after a botched operation in which they assassinated the wrong person on Norwegian soil. He also calls to mind the bombing of the King David Hotel in Jerusalem by Zionist paramilitary group Irgun, which took place on July 22nd 1946. Tunander told Norwegian news agency NTB it was unfair to conclude from his article, as for example Norwegian writer Øyvind Strømmen has done, that he wished to link Israel to the worst atrocity in Norway’s peacetime history. “Why he wishes to interpret the article that way is something he’ll have to answer himself,” said Tunander. Writing in Minerva, Strømmen said there was little doubt as to the intentions of the 63-year-old academic. “Does he insinuate that Israel was behind July 22nd, or was in some way involved? The answer, unfortunately, is yes,” he writes.